Eclipse TD 712z Mk2 review | What Hi-Fi? Eclipse's range topping TD712z Mk2s are a wonderful mixture of sublime brilliance and mediocrity. 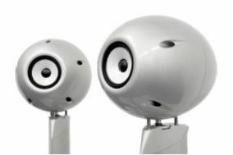 It all stems from the company's dogged determination to produce a speaker that can properly reproduce an impulse signal. Impulse? It's a single transient lasting a very short period of time. Such a signal contains all frequencies, and Eclipse believes if its speakers can produce an impulse correctly, then everything from timing to detail resolution will fall into place. It also means there isn't a crossover circuit – there's no need with just a single driver – so all the resolution, dynamic and phase issues of such circuits are bypassed. The enclosure is also held by the anchor, but is decoupled - meaning little of the drive unit's energy is fed directly into the cabinet. This reduces resonance to a very low level. The enclosure's egg shape helps too, minimising diffraction and improving rigidity. Making it out of ABS – fancy plastic to you and us – means it's strong and very well-damped. The design aim is to deliver greater bass and smoother treble without sacrificing the model's traditional strengths. And There's no doubt Eclipse has succeeded. The sonic presentation is more tonally even than before. There's enough bass weight for the speaker to sound balanced without using a sub, and its extra treble energy helps openness. High frequencies, despite the gains, still lack the extension and refinement expected at this price level. The 712's dispersion at treble frequencies is still relatively poor – the driver is too large to disperse high frequencies well – so precise positioning is crucial. But make no mistake, there is plenty to enjoy. When it comes to timing, dynamics and detail resolution, we doubt you'll find better – at any price. Much the same could be said of the stereo imaging. No other speaker in our experience, with the possible exception of Quad's electrostatics, can produce such a well-defined and precise sound stage. They play Tori Amos's Abnormally Attracted to Sin with all the insight and subtlety you'd want, yet still have the power and excitement the likes of Kings Of Leon deserve. Compare any of these to the Eclipses, and they sound messy and poorly organised. The flip-side is, they're more expansive tonally and can fill a room better. All speakers are engineering compromises. Eclipse has a different set of compromises to everyone else: give them a long listen and it's hard to argue they've got it wrong.